This game has a handful of bugs. 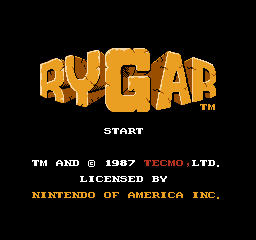 Rygar is an early adventure game for the NES that was very loosely based on an arcade game of the same name. It included both sidescrolling and overhead areas to explore. Two frames for a butterfly can be found in the ROM, but it's not used in the game. Its purpose is unknown. The ROM also contains sprites for an unused dragon enemy. It looks as though it would sit in a pit and rise up with its mouth open. The enemies in Ligar's Castle, the game's final area, have a palette applied that makes them one solid color, so they appear only as shadows. One of the enemies is a shadow version of the boss, Dorago, but the other two, a robot and a spider, are unique to this area. Their true forms can be seen by viewing the ROM in a tile viewing program. 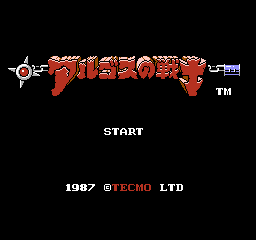 A text string "PASSWARD" is the only remnant of a disabled and unused menu item at the title screen of the Japanese version. It doesn't appear that any other references or ways to activate a password were left in the game ROM. The Japanese version is called Argos no Senshi and has a few different music tracks. 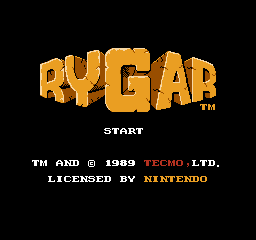 The European version allows Rygar to gain a maximum of 1023 Tone and Last and a maximum of 8 hitpoints as opposed to the other versions where 4095 Tone and Last could be gained along with a maximum of 12 hitpoints. This makes the final areas in the European version extremely difficult. Also, the ending text has a different wording. This page was last modified on 23 October 2017, at 13:53.